High-torque exhaust in a subtle design. Provides considerably more top speed. 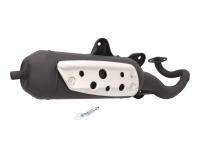 For those who want a new silencer and want more power, but do not want to ride with a small and particularly sporty sounding exhaust on their scooter right here. Very good torque curve and excellent performance on 50cc and 70cc sport cylinders. Fits on all Peugeot scooters with horizontal cylinder (Jetforce, Ludix) Exhaust system comes with E-certification Note: Note: If the exhaust comes with an E-certification [when restricted], the system can be easily used as an original replacement without performance enhancement. In this system, the restrictor is a welded sleeve reduction in exhaust manifold. Removal significantly increases the engine power, but it negates the general operating permit (ABE).